Fleet: 1x de Havilland DH89A Dragon Rapide (OO-JFN), 1x de Havilland DH90A Dragonfly (OO-JFN(2), 2x SABCA-Avro 504K (OO-APN, OO-APX), 1x Beech D18S (OO-APO), 4x Avro 652 Anson (OO-ANT, OO-APG, OO-APN(2), OO-APX(2), 2x Lockheed Hudson (OO-API, OO-APM), 2x C-47/C-53 (OO-APB, OO-APC). History: although transport flights on demand started around 1935, the company was officially founded on March 1 1948 by John Mahieu to conduct pax and cargo charters from Brussels-Haren and within the Belgian Congo. 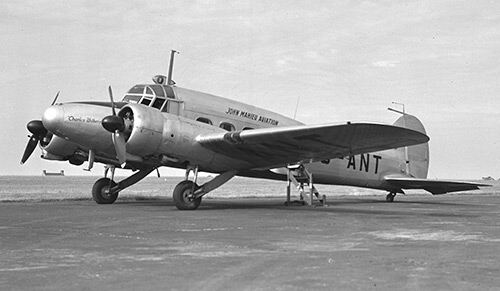 From 1948 on, they cooperated with COBETA, transferring some of its aircraft to them. During 1954 the company ceased operations.